Tahitian Taj is a second-row North Myrtle Beach resort with large vacation condominiums and spacious balconies. Lounge poolside while the sea breezes blow in off the Atlantic Ocean. 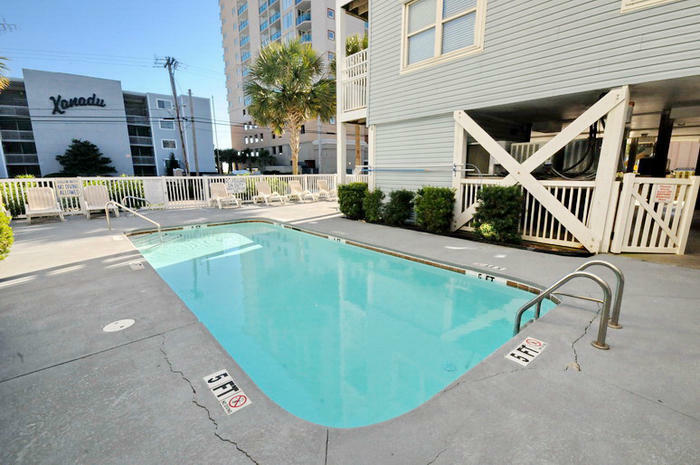 Though the North Myrtle Beach sun shines down on you throughout this North Myrtle Beach vacation property, you can remain nice and cool with a refreshing dip in the beautiful swimming pool. Or just walk across the street to the beach where a coastal wind always seems to blow. It is a beautiful North Myrtle Beach vacation destination with gorgeous accommodations. Your family will be happy to stay in such elegance where the lush exteriors are as inviting as the well designed interiors. Tahitian Taj is located in the Ocean Drive section of North Myrtle Beach, South Carolina. The Cherry Grove Fishing Pier is nearby as is the salt marsh inlet that meets the Atlantic Ocean just north of Tahitian Taj. It is a pretty section of beachfront and very family oriented. Though the peace and quiet surrounding this North Myrtle Beach vacation retreat will make it seem like you are light years away from the major attractions, you are really quite conveniently near everything you could possibly want to do during your North Myrtle Beach vacation. Championship golf courses are only minutes away as is a popular waterfront shopping complex that features live theatres where big-name performers grace the stage, award-winning restaurants and plenty of charming shops. Exhilarating flumes at water parks are close and so is the roller coaster that is just across the street from the ocean. Oceanfront state parks offer a natural oceanfront scene where you can swim, picnic, play and walk out on the long fishing piers. All this and more is easy to reach when your North Myrtle Beach vacation includes oceanfront accommodations at Tahitian Taj in North Myrtle Beach, South Carolina. Elliott Beach Rentals is not affiliated with onsite management or the HOA of Tahitian Taj.